On March 1st, 1987, Starbucks opened its first Canadian store, Seabus, in Vancouver, B.C. In 1995, Starbucks formed an alliance with Chapters, Inc., the Canadian bookstore chain. The next year marked the first stores in the Ontario market, with the January 20th opening of 5 stores throughout the greater Toronto area. To date, Starbucks Coffee Canada has over 700 company-operated stores and over 250 licensed concept stores across the country. You can follow Starbucks Canada on Twitter also. 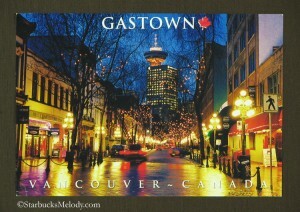 The partner included a lovely postcard of Vancouver where you can see one of the buildings in the Starbucks card! I really don’t expect this to get a lot of comments, but I had to say a big “thank you.” I am touched by the gifts that partners and customers have sent me now and then! Congratulations to Starbucks Canada on 25 successful years! If you like reading about Starbucks Cards, I have also written about the Twilight Retreat Card – First and Battery Starbucks, Destination Cards, the Evolution Fresh Starbucks Card, the fall season Braille Card, Kyoto Japan City Card, and many more. It was only just a couple of years ago that one could buy a customized Starbucks Card. Taxim Hill Hotel Starbucks (Istanbul). I enjoy seeing all the Starbucks cards and this one is very attractive. I really hope they continue to produce cards. Thanks to the partner for sending it to you. I really like that card. The Chicago card is my favorite of all of destination cards, but this one comes close (it actually looks a lot like the Chicago card). It’s a really cool card – and it tells a really big story (hockey stick, whale, mountains, city, etc.) about Vancouver – not just a one sided view. Isn’t this Chicago’s 20th anniversary with Starbucks? Hopefully we’ll get a new card too! Oops – I meant 25th anniversary. I think the first Chicago Starbucks opened in the fall of 1987. CD – You are absolutely right! I think a 25 year Chicago Starbucks card is a GREAT idea! Hopefully they’re working on it (and fast). I’m still doing some Google searches …. Thanks for the articles Melody. It’s hard to believe 2007 was half a decade ago. Now I can’t stop thinking about a 25th/Chicago card. Since they’re using the silver foil on the card, perhaps they could do a silver Cloud Gate (a.k.a. “the bean”) on the card! CD, I’ve heard a number of items coming for fall – But my gut says no special Chicago card. Well, they have until March 26, 2018, to plan the 25th Anniversary Card for Washington DC! I’m with CD re: the Chicago card……it’s one of the most colorful (but not TOO) and really shows the skyline, the el….. Of course I’d be partial but really think it is one of the most attractive. And, I wish they’d continue to keep them in at least some stores. Why not? re: when they 1st opened here (first Sbux outside Seattle), I know that yr because I remember my 1st cup was in the late 80’s plus H.S talked about it last April (2011) when he was speaking here. (also about having named a coffee for the area: GOLD COAST) how quickly after hearing him say that, Gold Coast got stuck with all that ‘Morning Joe ‘MSNBC junk……..and barely that little wording of “Gold Coast blend” nr the bottom of the new unattractive packaging. Sorry slightly off track. 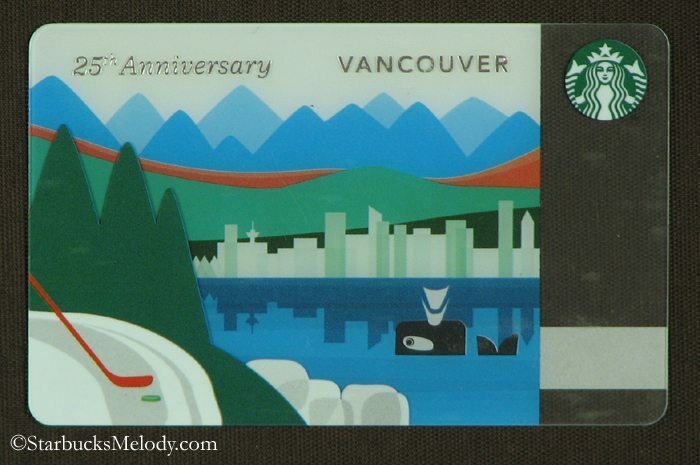 It is nice they did a 25th anniversary Vancouver card. Apparently not Chicago…. I would love to see special cards for special times as per the Chicago 25th anniversary. The SB cards on display by me are just basic and although nice I would not go out of my way to get one. I have heard rumors that they will do a NJ card. Like with the issuing of stamps, does SB have a committee that determines the design and issuing of the cards? The card looks so nice! I used to love having Starbucks cards (when I was 14ish, they looked so cool, and felt even cooler! haha) but always end up losing them in about a week. Still, this Vancouver edition card is a great design…hope you don’t lose it! I had to come back to this post to say once more how nice this card looks. Great card for a great city. Whoever designed this one for Starbucks did a fantastic job. Denise. Gold Coast is still called that in Canada, no Morning Joe for us. I learned the story of it’s name recently when one of my baristas did a tasting with our DM during her shift supervisor interview. She told us all about it when she came back to the store. Incidentally – she paired it with a chocolate caramel cheesecake which apparently was delicious together. @denise, I noticed tonight that gold coast is called gold coast, with the joe graphic in the lower right hand corner, of the bold pick display card they put on top of the brewers. @CD: yay!!!! I have to check this out this morn. btw, went to Streets last week…… while I still like it better BEFORE the ‘evening’ transformation….everything about it….including the old (pre- booze) front patio , which I thought was one of the nicest (wonder where all that beautiful, well-made furniture went? ), I was very surprised that the change didn’t really seem to alter the inside environment too much. thankfully. I had a Clover Blue Mtn and unlike what I remember from last yr, this was delicious. (but I’d never pay that price per/lb).